We have a 20 acre field and half of it was planted in hay, which we harvested last year. After much consideration we decided to plant the rest of the field in hay, instead of leasing it out. In 2013 , we paid a gentleman to custom bale it for us, and we paid per bale. This year we are working with him on the other acreage. We split the cost of the seed and fertilizer, he planted it and when it comes time to put up the hay, we are doing shares. ~We do not need to purchase any equipment. You need several pieces of equipment to do hay, a mower, rake, and baler. Working with someone who does hay as part of their living is an alternative to having to invest the money into the equipment, ourselves. ~We do not have the time. Extra time is not something we have right now. We have plenty of pots in the fire! You have to choose where your going to focus your energy, and our focus right now is raising sheep, and wool. You add family, a full time job (Mike) homeschooling, gardening, etc. we don't have the time needed for another venture. ~We want a good hay source. Nothing is more frustrating than not being able to find good hay, as winter approaches Some years it has been very difficult! Last year, it was so nice to not have to worry about it. When you do shares, you typically split the cost of seed and fertilizer. Your provide the land and they provide the labor. It is less money out of pocket. Hay cost vary from year to year. Some years we have paid $3.00 and other years closer to $6.00 a bale. With shares, we know we will get half of what is harvested. With the amount of animals we have, we have more than enough to get through the winter, as well as have extra hay, that we can sell, which helps offset the cost. If you have some extra land, and want to grow your own hay, but don't have the equipment or time, doing shares is one option. 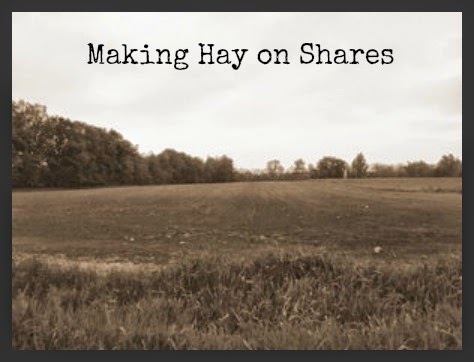 If you decide to do shares with someone, whether it is in hay, crops, etc. be sure to do it with someone you trust! We have had some, not so pleasant outcomes, in the past. It can be very disappointing to pay out money, to only have it wasted. References are always a good idea! We have a neighbor do our hay fields too. It's a 60/40 split, us getting 40%. Hay around here, first cut is 5-6 dollars a bale for grass hay and up from there. Even with the split we get about 1200 bales which is plenty for our horses plus a lot to sell. I am glad our hay prices are not that high around here! Unless there is a bad year-then I have seen it that high. We have 7 acres we will be doing that with this year. Good quality hay is very hard to find. It has been a great option for us. Hee-hee, it's obvious were in the same biz! I'm posting about hay too! BTW, our hay around here if your lucky to know a farmer might be $5 minimum but if not which it's hard to always plan cause you don't know if they'll be drought. One year we bought a bunch of sheep, etc, etc. Anyway, open market we're paying $6-$10 for good quality hay! The equipment and back breaking labor saves us a BUNCH! Hard to get thought a winter when you are paying that much! Our neighbor hays our field on shares. It's a small field, maybe 15 acres, in native grass. He only does round bales; I'd prefer small bales, but he lives right next door and it benefits us both. He gets 60% and we get 40%. It isn't enough to get us through the winter, but it sure helps. With hay prices being unpredictable over the last few years, every lit bit helps! This is great information! I've been trying to gather more of an understanding of hay farming, baling, etc. This post was really helpful. I think when it comes time, I would definitely look into doing a share! It is a great option when you don't have the equipment or experience to do it yourself!